For a high quality finish to your home or premises, our ornamental range of steel fencing is the perfect solution. 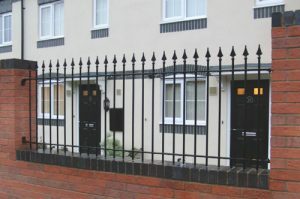 Our range of ornamental fencing adds the finishing touch to your home or property. Fabricated from high quality steel with a durable powder coated finish, our fencing range is an ideal solution for use in home frontages or your garden. With a wide range of colours to choose from, we supply ornamental fencing in standard panel widths which are easy to install – or we can handle the entire installation project for you.